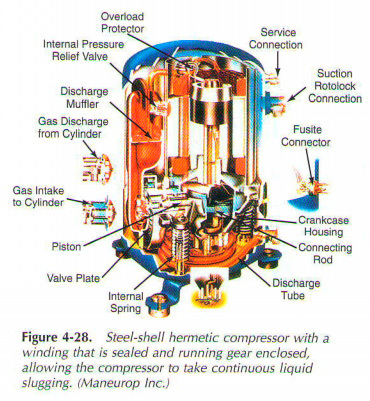 Motor hermetic compressor sealed inside a dome or on the casing of the compressor, ft directly connected to the compressor. Crankshaft seal is not required. In the rotor of the engine, as a rule, a press fit on the crankshaft. Some motor-compressors are manufactured with the motor on top. Other at the bottom of the engine and compressor on the top. Sealed unit is usually in the spring mounted inside the hermetic dome. This prevents most of the compressor from the vibration felt outside the dome. The pollution and the suction inside the dome made flexible. Connection through the dome allows mounting compressor iines to the rest of the system. The electrical motor to pass through the dome through isolated hermetic seals. In refrigerant vapor beyond the dome of the suction through connector cooling the motor and picking up some oils (less than 1%), before it is drawn into the suction chamber for compression. The oil produced with the help of the refrigerant helps lubrication and seals, valves and other elements in pairs path. This oil circulation perhaps due to foaming/misting of the oil as it excites the rotating elements in oil Carter. In hermetic compressors, see Fig. 4-27. 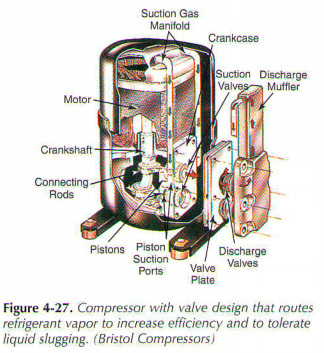 Compressor shows the basic twin-piston compressor with a design that guides the refrigerant vapor through the intake manifold muffler directly to the valve, to improve efficiency and ingress of liquid refrigerant. Some motor-compressors operate on two speeds. They are popular in large systems and air conditioning where changes in heat load. Fig. 4-28 illustrates hermetic compressors. He has an inner and an outer steel shell and combined in one housing. Suction steam passes through the engine area, engine cooling. The device has a built-in battery. This prevents fluid from the return of the cylinder area. Discharge line was rolled to the block. He holds oil enough heat to vaporize any the liquid refrigerant that may have already returned. The piston head-sculpted and has a circular valve plate design. It provides a balanced input and output of the steam flow. The device has rotolock connections, which allows serving. This block contains the internal discharge muffler, which prevents excessive pair of pulsation and vibration. Cm. Section 4.15.7 for more information. The system also has an internal overload which is sensitive to temperature and current.